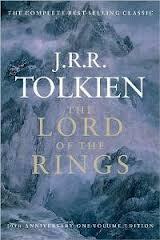 This book is mostly centered around a group of people who call themselves the fellowship of the ring. Their goal is to throw the One Ring into the cracks of doom, the place where the one ring was forged, in order to destroy it. The One Ring is dangerous because one of the main antagonist, Sauron, receives most of his power from it. The fellowship of the ring consists of seven people, Gandalf, a wizard, Frodo, a hobbit, Merry, a hobbit, Sam, a hobbit, Pippin, a hobbit, Legolas, an elf, Gimli, a dwarf. First, Frodo, Sam, and Pippin depart from their homes and they are going to Rivendell to find Gandalf. Then they depart with Gandalf and the rest of the company. When they reach the Mines of Moria, Gandalf falls into a chasm while trying to stall so the others could escape, but later, they become split at an area with Merry and Pippin taken by orcs, Frodo and Sam off to destroy the ring, and the rest to try to save Merry and Pippin. Fortunately, Merry and Pippin manage to escape and the rest of the fellowship meets Gandalf who has become Gandalf the White. They take over the castle of Saurman, a minor antagonist, and prepare to attack Isengard with the king Théoden and the king’s troops. Then after a siege of Minas Tirith, they go attack Gondor. This book is an extremely long book and it was the longest book I have ever read. I would advise that you be at least thirteen and a very good reader for your age or about sixteen. This book is a very slow paced book but it is also very detailed. I like this book because since it is so detailed, then it is very easy to visualize this story. I would think that reading this book might take about a month or so for most readers. The author uses old English which may be a bit confusing but I enjoyed the way the characters talked because it was very interesting. The vocabulary of this book is quite advanced. I think that for most people who do not read quite a bit, this would probably not be a book for you to read. It is a book that is quite intricate but overall, it is still quite exciting. I would rate this book ten out of ten stars but only if you are an avid reader. 1. Why does Gandalf think that Gollum was related to hobbits? 1a. Because history states that he lived with people who were like hobbits before he became Gollum. 2a. He thinks they are a bit different from what he had envisioned and don’t really care what he thinks. 3. How did the hobbits stopped from being crushed in the forest? 3a. Tom Bombadil came by and saved them. 4. Why can Strider be trusted? 4a. Because Frodo’s letter from Gandalf said Strider was a friend. Strider also knew he was also known as Aragon. 5. What is Bilbo doing at the Elves’ palace? 6. In the beginning of the twin towers, what happened to Merry and Pippin? 6a. They were taken by orcs and were being brought to Saurman. 7.Why did the people with Aragon stop pursuing Merry and Pippin? 7a. Because they saw Gandalf, and Gandalf told them that Merry and Pippin would be fine. 8. Between Legolas and Gimil, who killed more Orcs? 8a. Gimil did but not by very many. 9. What relation did captain Faramir have with the fellowship of the ring? 9a. Boromir was his brother and Boromir traveled with the fellowship. 10. At the end of the two towers, what is happening to Frodo, and who or what attacked him? 10a. Shelob, a giant spider, attacked him and paralyzed him. Sam then fended of Shelob but thinking Frodo was dead, Sam started to leave, but some orcs took Frodo away because they figured out that he was paralyzed. 11. Where did Aragon, Legolas, and Gimil go? 11a. They went to find reinforcements. 12. How was Eówyn healed? 12a. Aragon used kings foil to heal her. 13. What did the mouth of Sauron show Gandalf? 14. How did Sam and Frodo finally destroy the ring? 14a. When they got to the cracks of Doom, Frodo claimed the ring. Then Gollum took the ring from Frodo, but fortunately, he fell into the cracks of Doom and destroyed the ring. 15. Who was behind the trouble in the Shire and what was he or she doing? 15a. Saurman was behind it and he had hired people to bully the hobbits so that he could control them all.